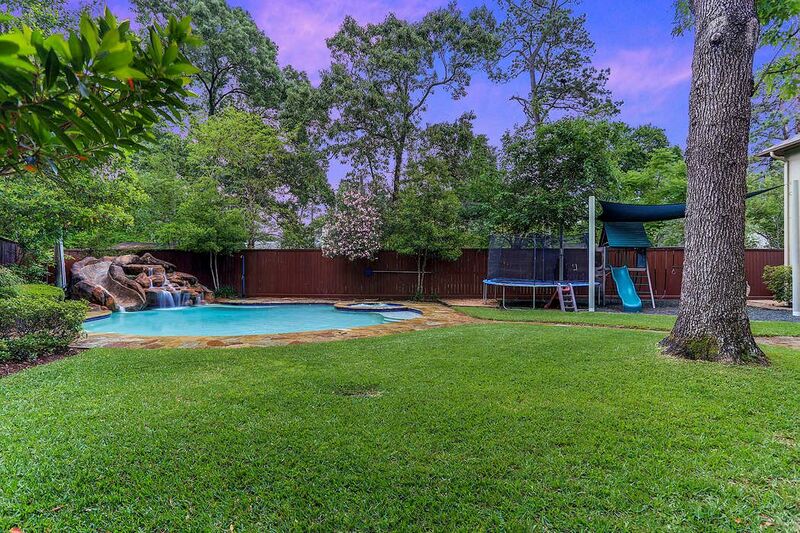 1254 Ridgeley Drive, Houston, TX 77055 | Martha Turner Sotheby's International Realty, Inc.
A view of the lush backyard with private pool with slide, water feature, and hot tub! Plenty of room for a playset and trampoline, too (also pictured here)! 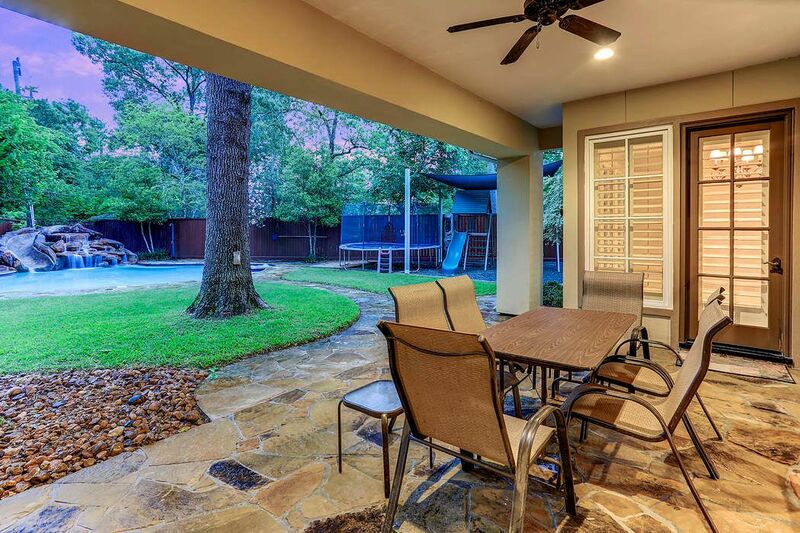 Relax in the back on this covered patio with ceiling fan and recessed lights. Perfect for large parties or relaxing alone! 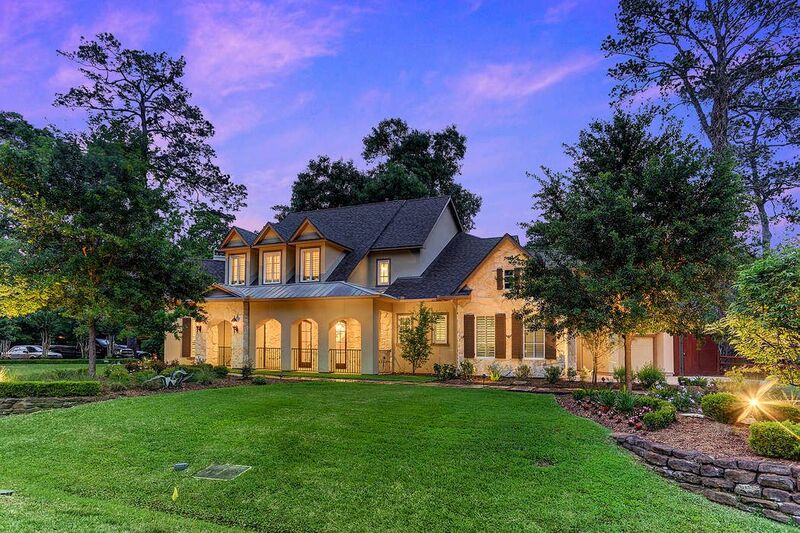 Welcoming front porch with professionally landscaped grounds leads family and friends to the beautiful front door. 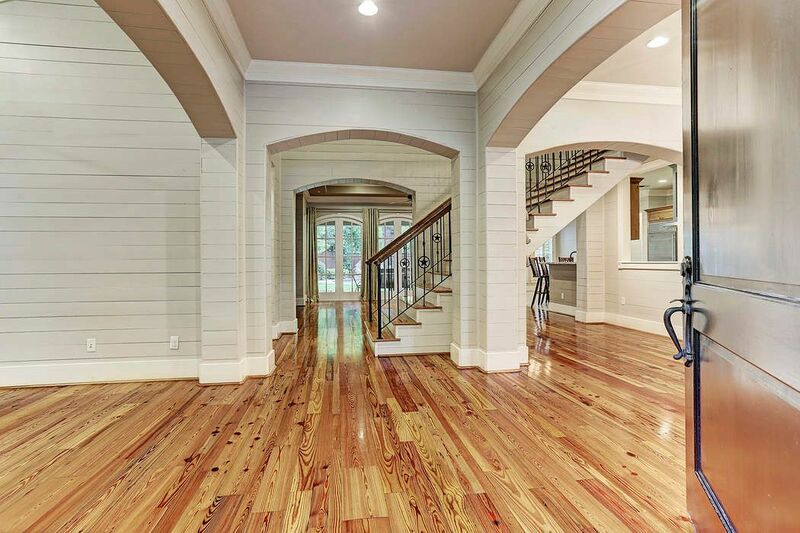 The entry is graced with variegated width pine hardwood floors and opens with ways to the Living Room/Library to the left and the Dining Room to the right. The entry further opens to the staircase and the Family Room. 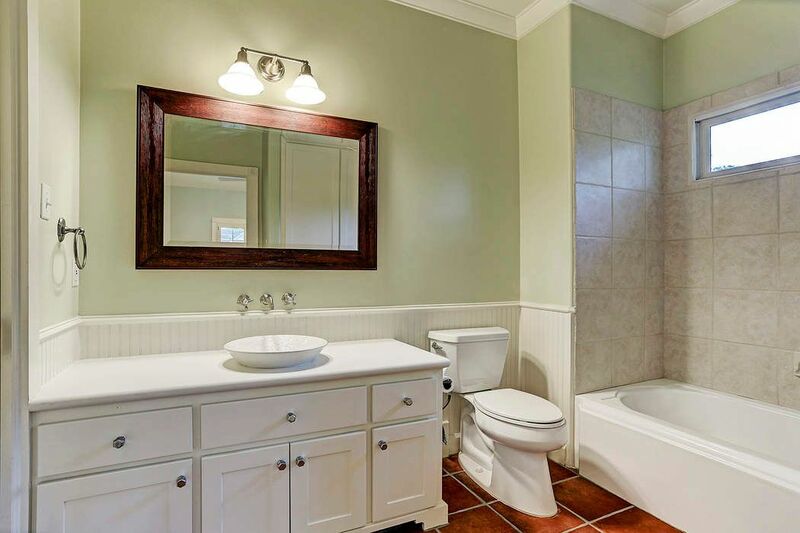 There are two powder baths-formal Powder Bath adjacent to the Family Room and the informal Powder Bath in the mud area ideal as a pool bath. The formal powder bath has furniture style cabinet with vessel lavatory. The Dining Room has 2 divided light French doors overlooking the front porch and walkway, variegated width pine floor, ship lap walls, chandelier and opens to the Entry, Butler’s Pantry and staircase. 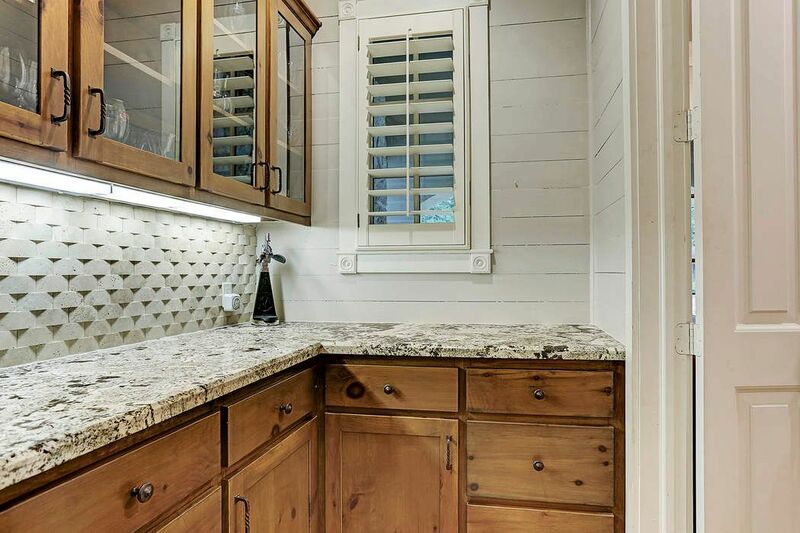 The knotty alder cabinets and contrast color of the island accentuate the style of this home. Breakfast room provides access to the covered patio and backyard with pool, and it connects the Family Room and Kitchen. 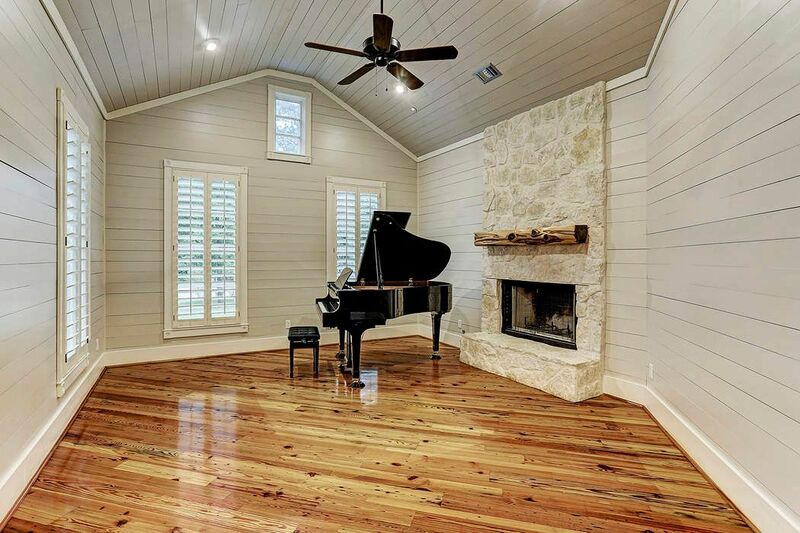 The vaulted ceiling, variegated width pine floor, stone faced fireplace with log mantle and gas jet starter are complemented with the ship lap walls, (3) windows with Plantation shutters, recessed lighting, crown molding and fan. 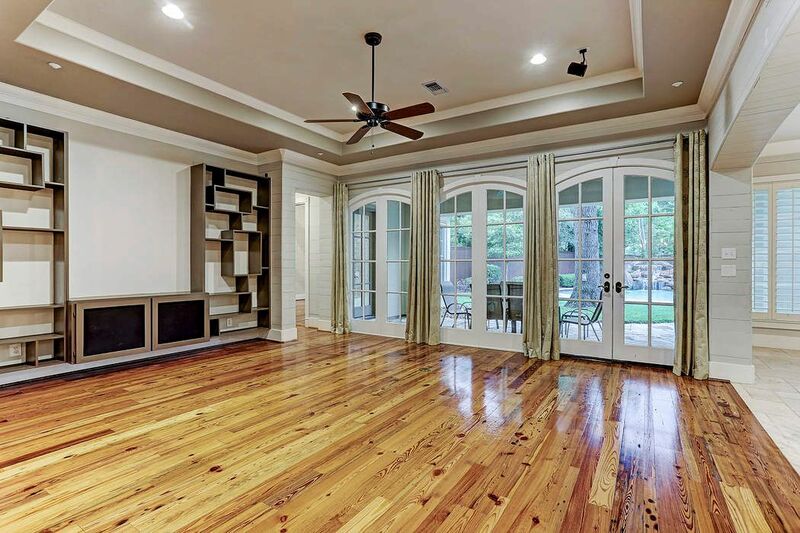 The Family Room opens to the Kitchen and Breakfast Room and has ship lap walls, variegated width pine floors, (3) sets of FRENCH doors (1) operable and (2) fixed and overlooks the covered patio, yard and pool. 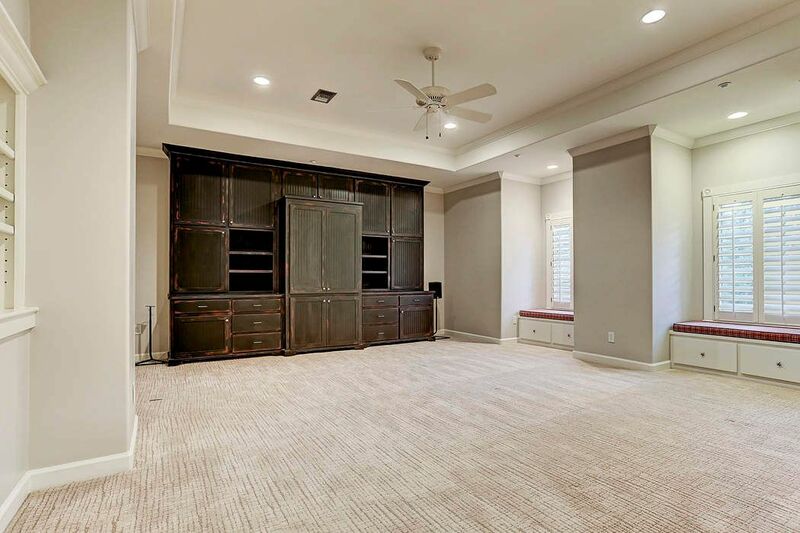 The Family Room boasts a coffered ceiling, recessed lighting, crown molding, and archways to the Entry, staircase and kitchen. Great layout! The home office is located off the kitchen in the “service area”of the home. Ideal as “command central “ the built in desk with laminate counters coordinates with the chiseled edge travertine floor and ship lap walls. 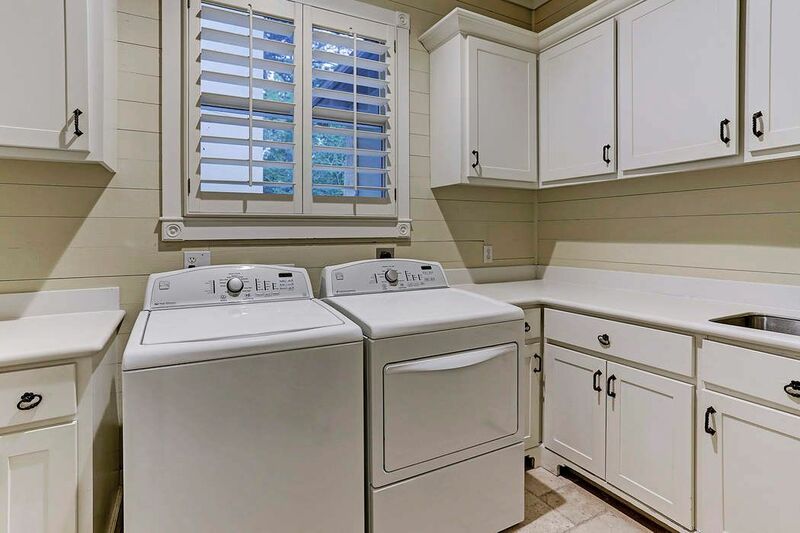 The laundry room includes washer and gas or electric dryer connections, room for an extra refrigerator or freezer, solid surface counters, built in ironing board, stainless steel soaping sink and a window with Plantation shutter. The Master Bedroom located DOWNSTAIRS has a beamed and trussed ceiling, variegated width pine floor, stone faced fireplace,windows facing south and west plus a FRENCH door to the covered patio, spa and pool. 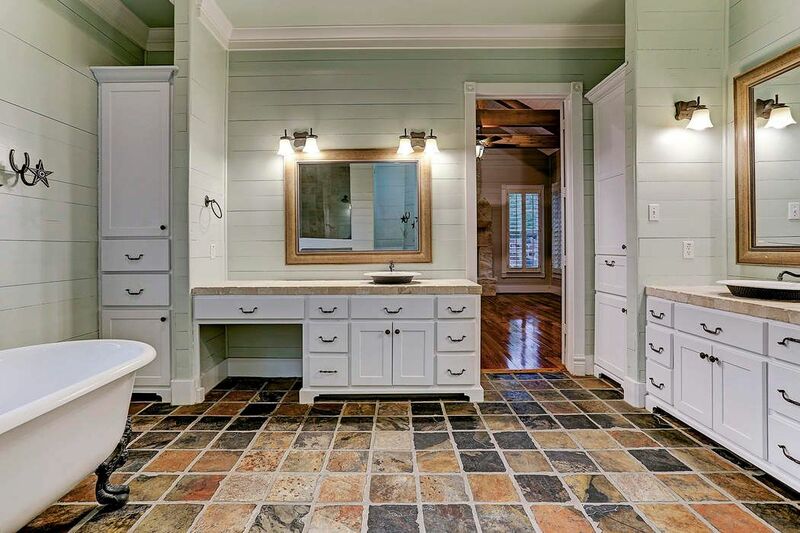 The master bath includes dual separate vanities (one with make up knee space), decorative mirrors and decorative lighting, double coffered ceiling, private water closet with Kohler toilet and linen cabinet with laundry hamper. Graced by slate floor, the master bath has a claw footed tub, large tumbled marble shower with dual shower heads, shampoo shelf and frameless glass enclosure and dual separate vanities. 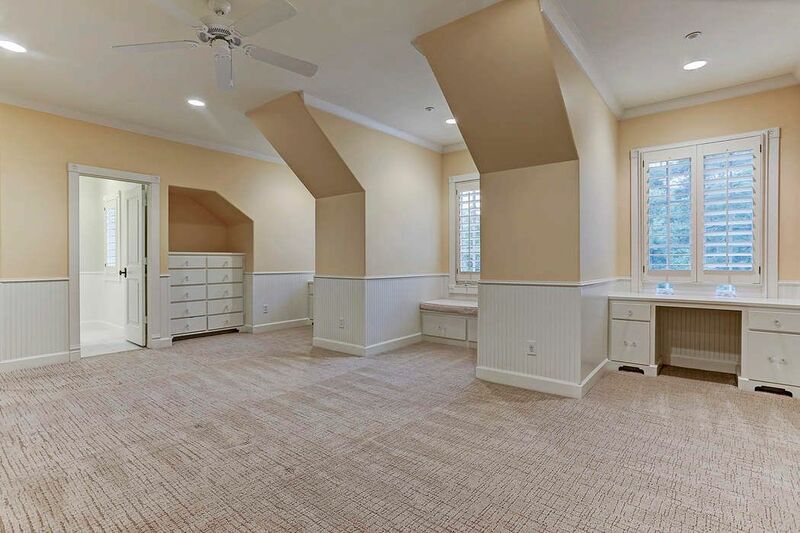 Located at the top of the stairs to the right, Bedroom 2occupies the front of the house and has (3) dormer windows with a window seat and 2 desks, (2) reach in closets (out of view) and a built in dresser. Bead board wainscot too! 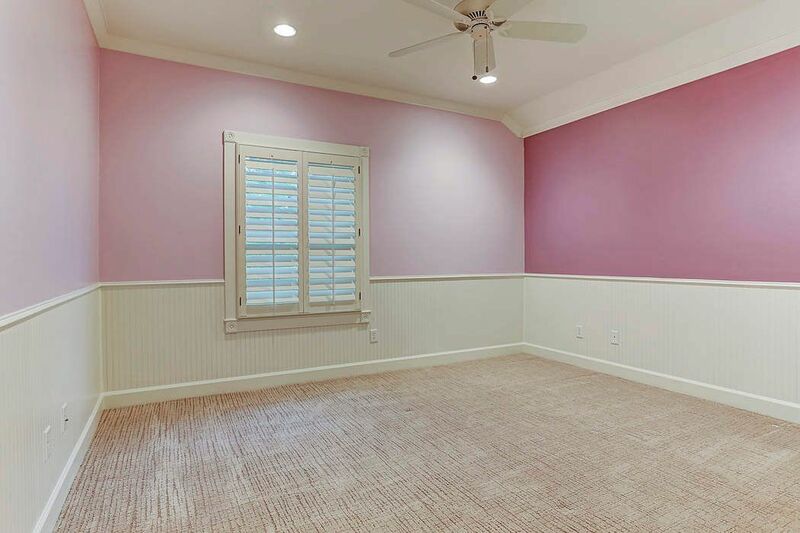 Located across the Hollywood Bath from Bedroom #2, Bedroom #3 has carpet, crown molding, bead board wainscot, windows with Plantation shutters, recessed lighting and ceiling fan. 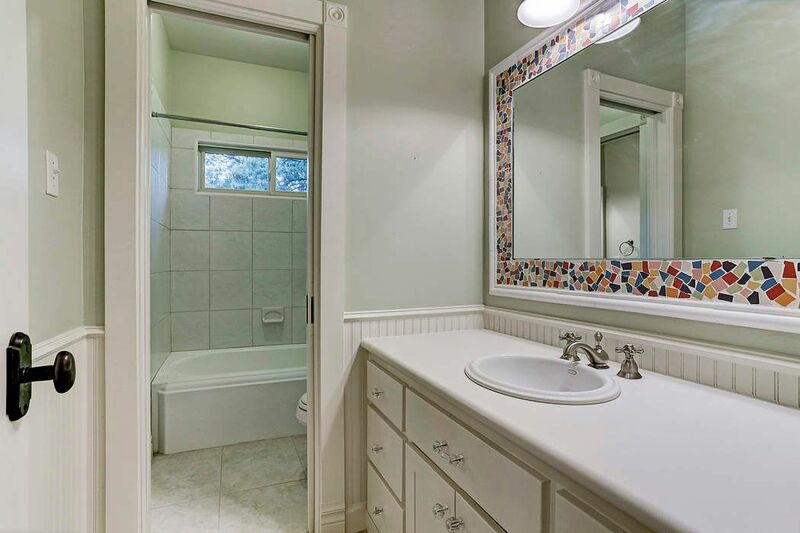 This full bath has dual separate vanities and a shared tub/shower and toilet room. 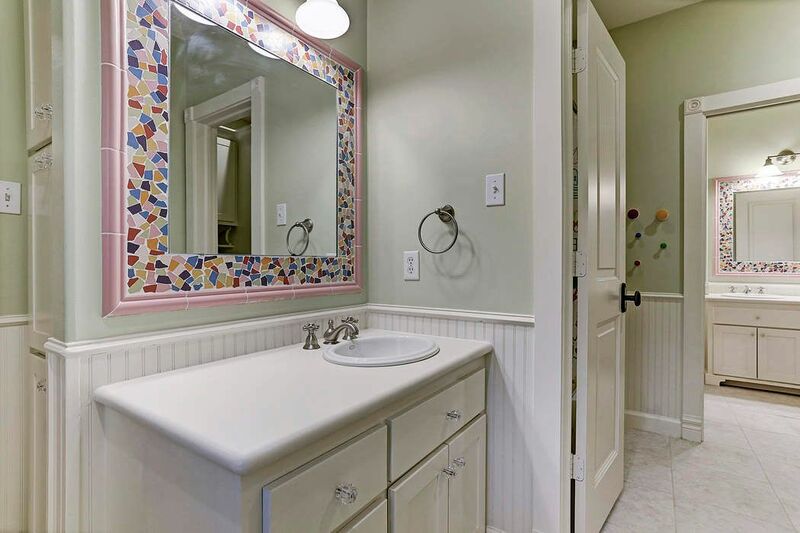 One vanity is accessible from the game room so guests can enter the bathroom without entering someone’s bedroom. Located upstairs near Bedroom #5 is the computer/homework loft. 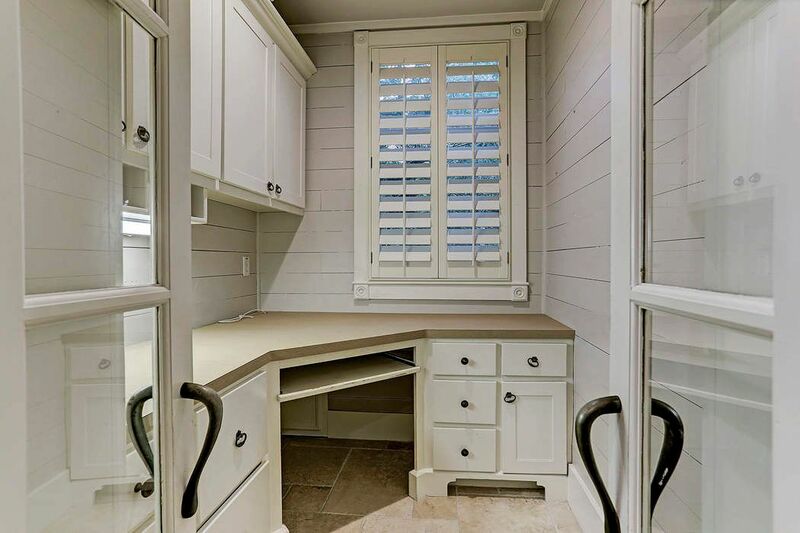 There is a closet, large built in desk with keyboard shelf, upper and lower cabinets and drawers. Under cabinet lighting and recessed lighting. 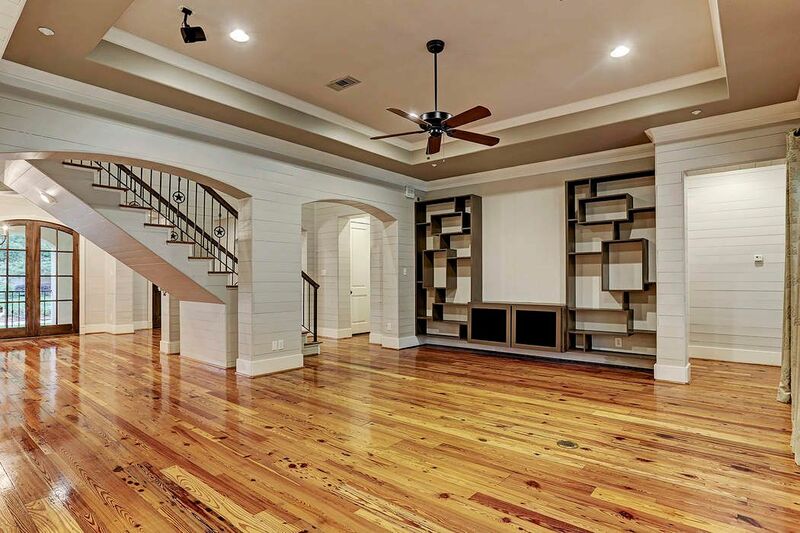 Located at the top of the stairs to the left is the game room complete wi5 built in entertainment center and wall of bookcases. 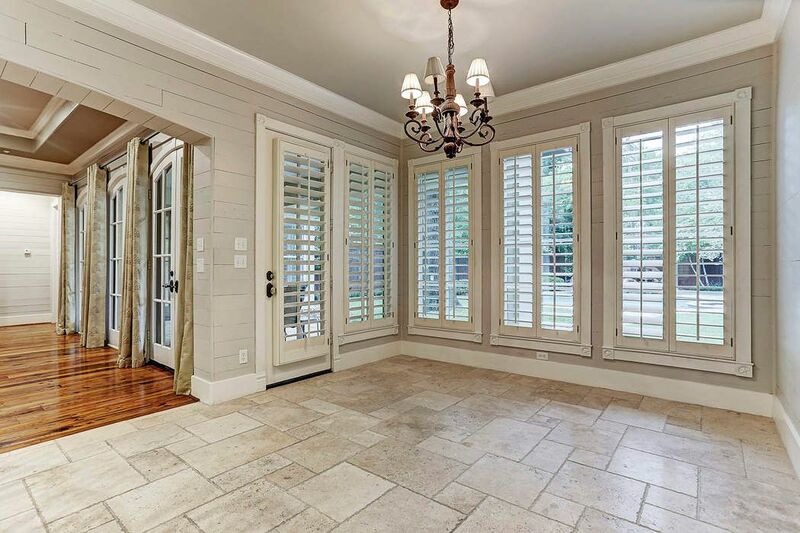 Coffered ceiling, crown molding, window seats and windows with Plantation shutters. 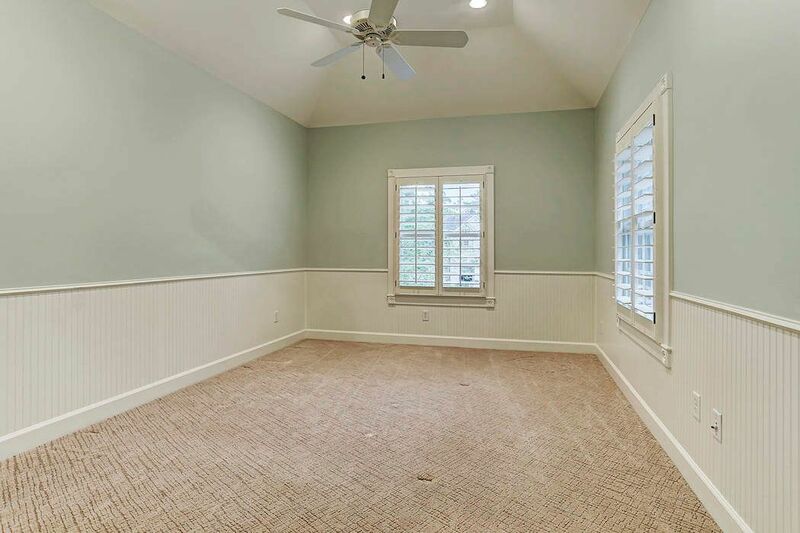 Located at the end of the hall upstairs is Bedroom 5 with en suite bath, carpet, bead board wainscot, windows with Plantation shutters and gambrel ceiling. Nice private bedroom and bath. 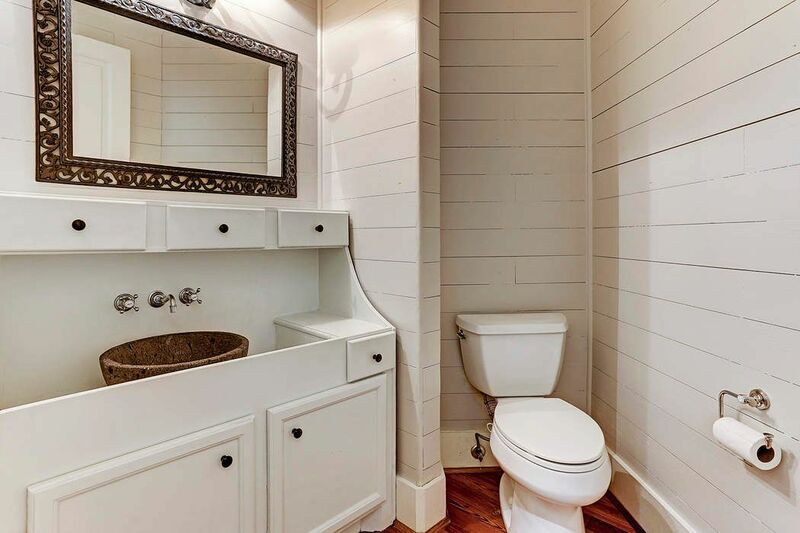 This en suite bath has a tub/shower, solid surface vanity with counter mount vessel sink, bead board wainscot, decorative lighting and mirror. There is a walk in closet with single and double hanging rods too. 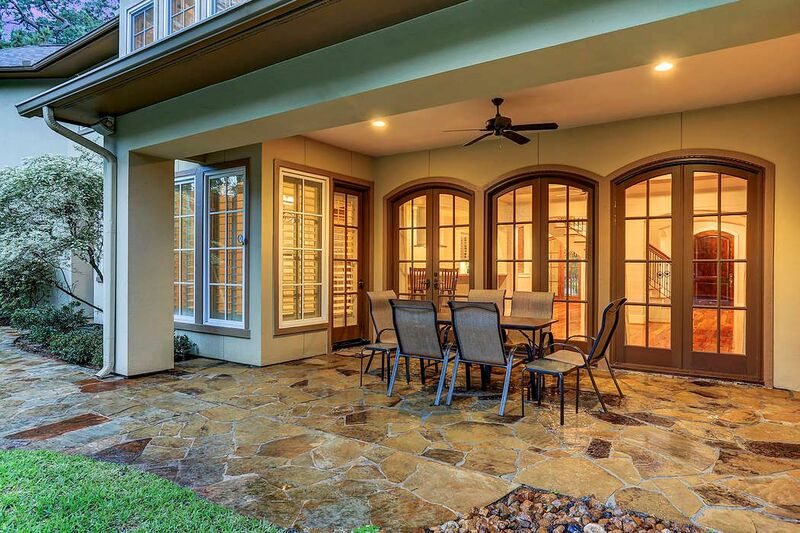 Another gorgeous view of the covered patio with stone flooring, and also showing the breakfast room and entry, inside the home. 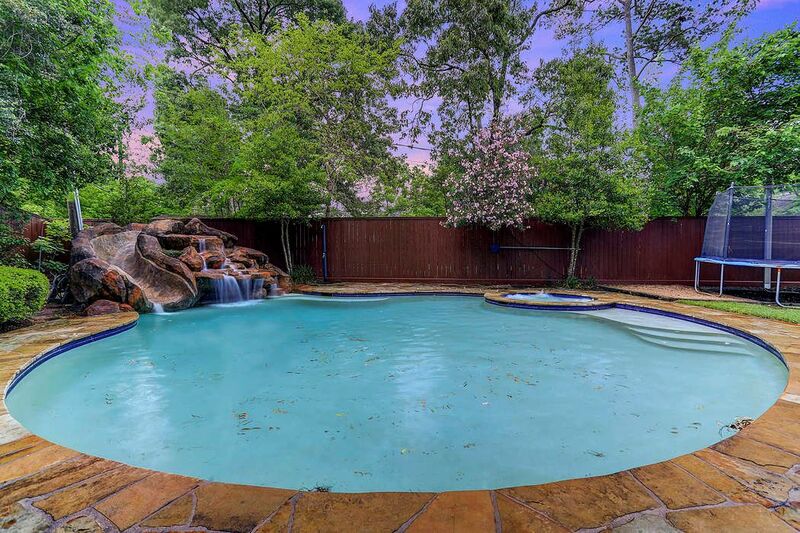 A close up view of the beautiful private pool, water slide, waterfall feature, and hot tub. 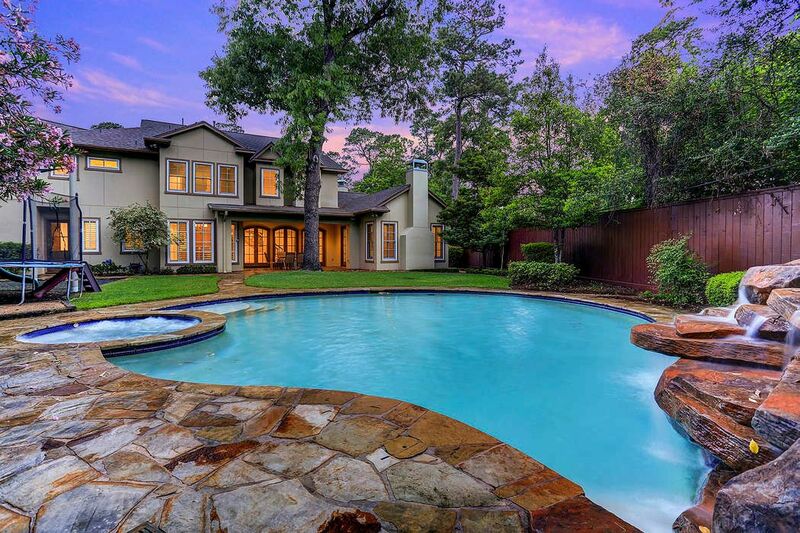 A gorgeous view of the home and outdoor covered patio from the private pool and water slide. 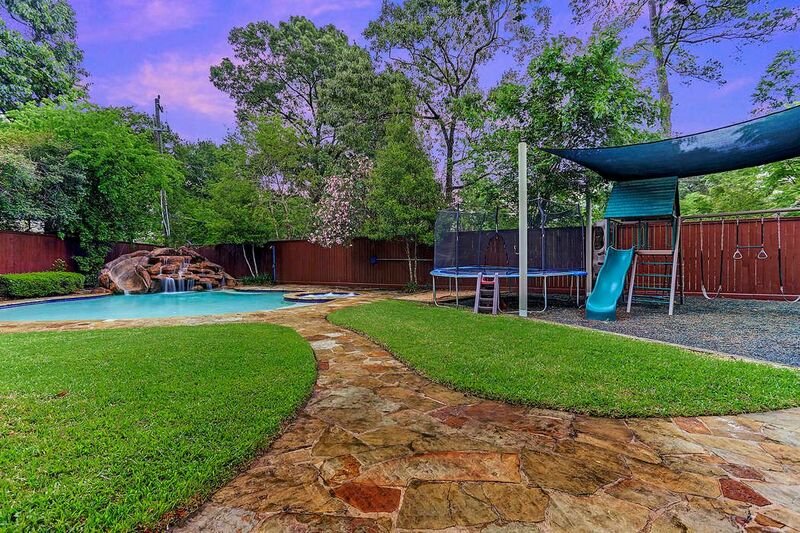 Another view of the backyard, showcasing the walk way to the play set, trampoline, and private pool. Welcome Home to 1254 Ridgeley! 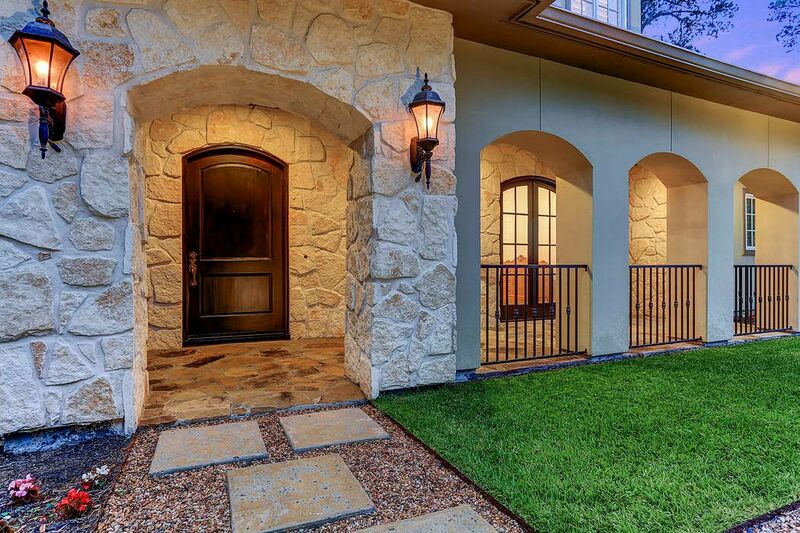 $1,550,000 5 Bedrooms4 Full / 2 Partial Baths5,011 sq. 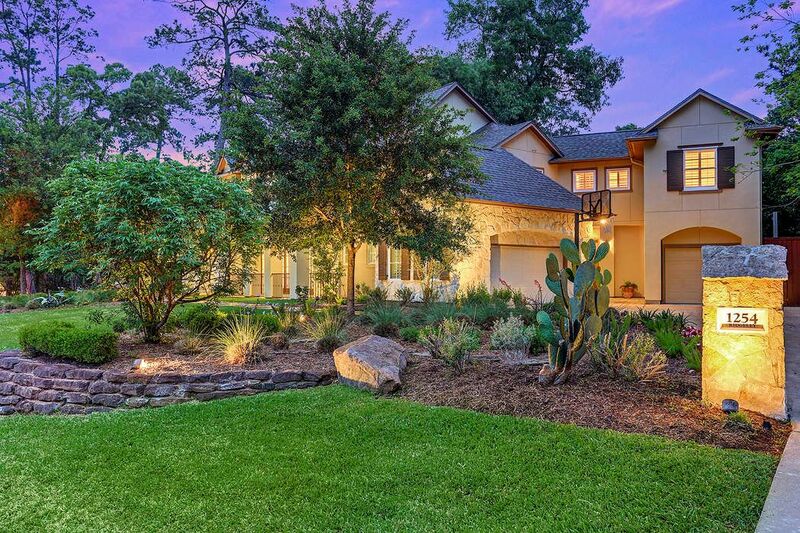 ft.
Nestled on a huge lot in the Memorial Village of Hilshire Village, this spectacular home is finished to the highest standards and exudes hill country charm. Manicured grounds link the residence to a beautiful setting where the uniformity of countless symmetrical arches exemplifies the blend of inspiration and fine architecture. Anchored by variegated width pine floor, the entry serves as a gathering place for guests, beautifully uniting the living room, dining room, family room and kitchen. 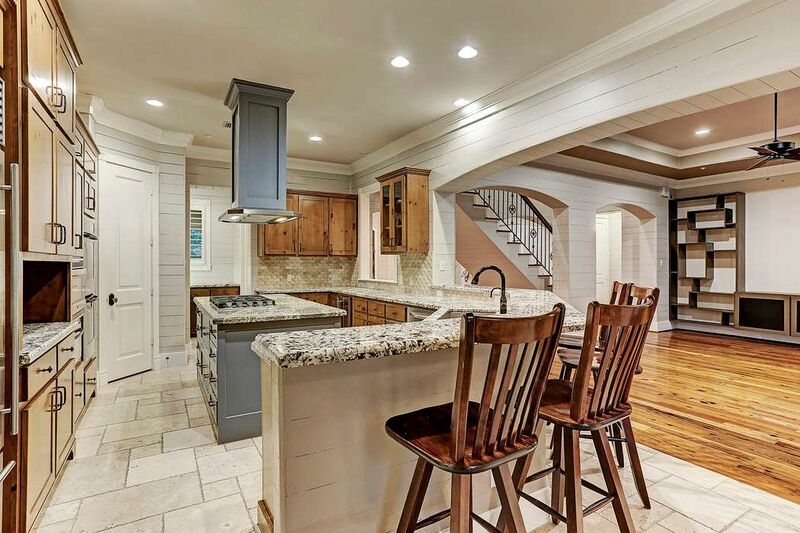 Adding layers of character to the home, ship lap, rich millwork, beams, different textures of stone and bead board wainscot are used throughout the interior creating an inviting ambience. Designed to embrace warmth, the cozy living room is embellished by a stone-faced fireplace and is enveloped by light, allowing a commanding view of the front lawn. 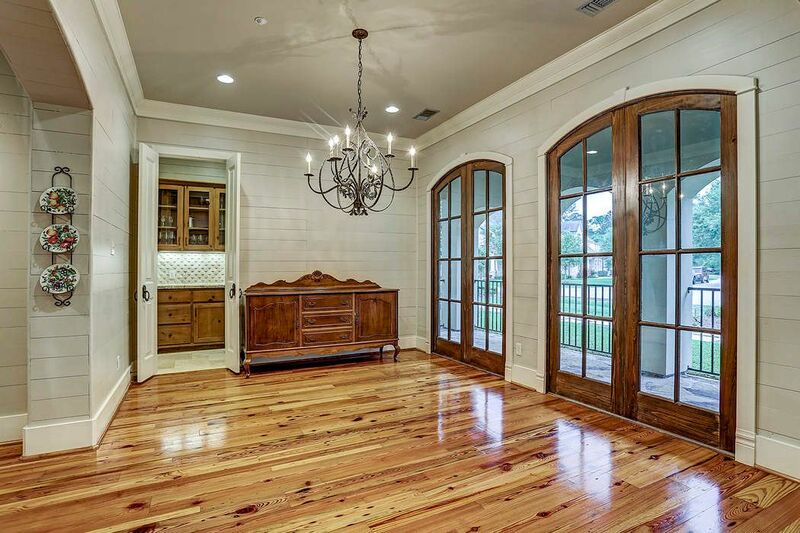 Adding interest, the dining room boasts dual French doors that showcase the expansive front porch and beautiful grounds. An engaging staircase graced by wood treads and an iron balustrade serves as the focal point of the downstairs. The family room is enveloped by light as banks of windows provide serene vistas of the patio and pool. 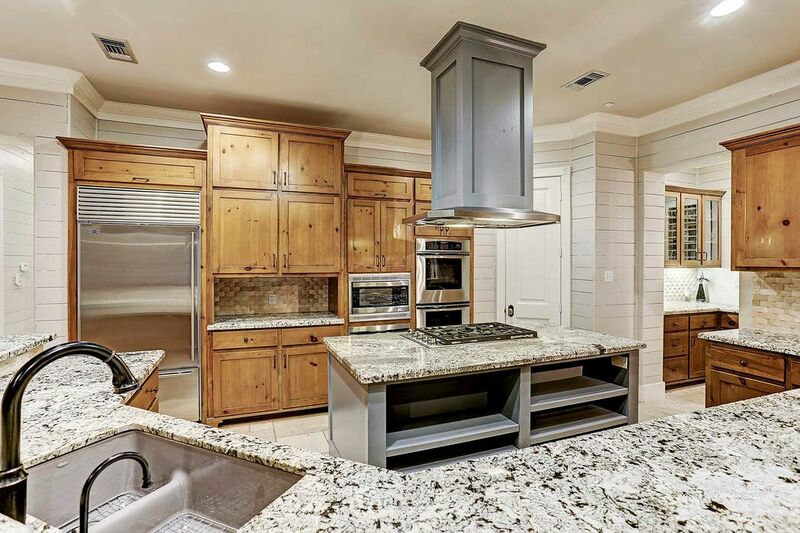 Chiseled edge travertine in a Versailles pattern anchors the gourmet kitchen that features knotty alder cabinets, granite counters with marble basket weave backsplash and professional grade appliances. 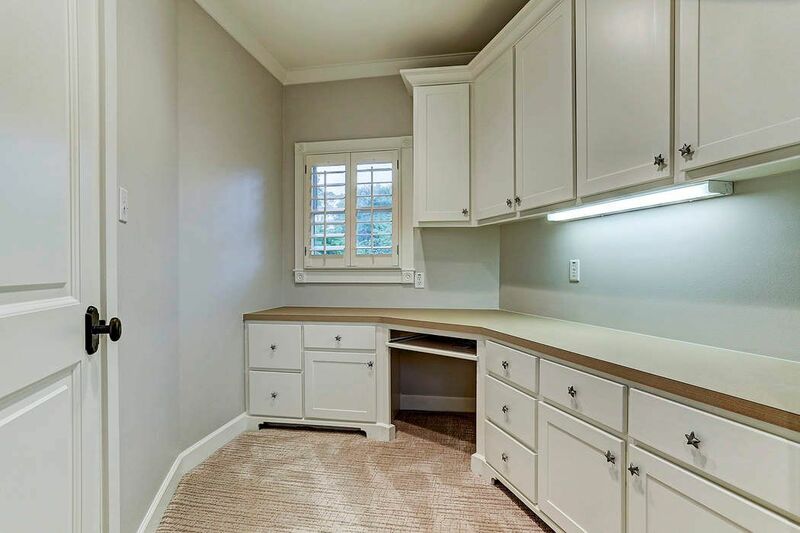 Distinctive spaces continue with the home office, and 2 mudrooms. 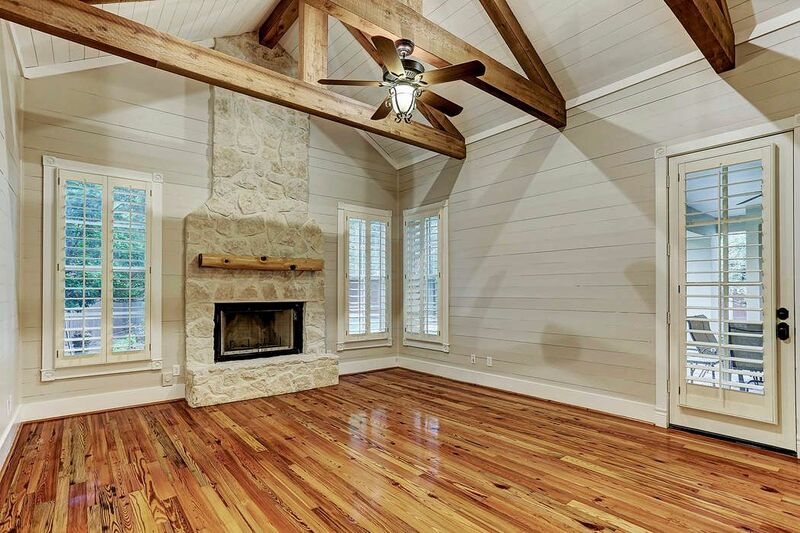 Stylish and full of light, the master retreat is marked by beamed ceilings, pine floor, ship lap walls and a stone fireplace. 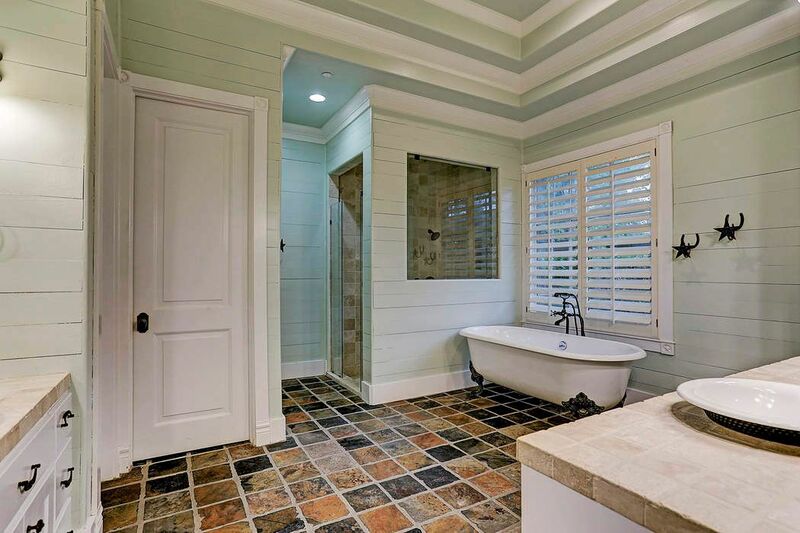 Timeless overtones are met with modernism in the impeccable master bath that features a slate floor, claw footed tub, tumbled marble shower with dual shower heads, dual vanities, and double coffered ceiling. Upstairs includes bedrooms 2 and 3 with Hollywood bath. Bedroom 4 has an attached bath, (2 separate vanities open to the hall accessible from the game room) and bedroom 5 is en suite. There is also a computer room.